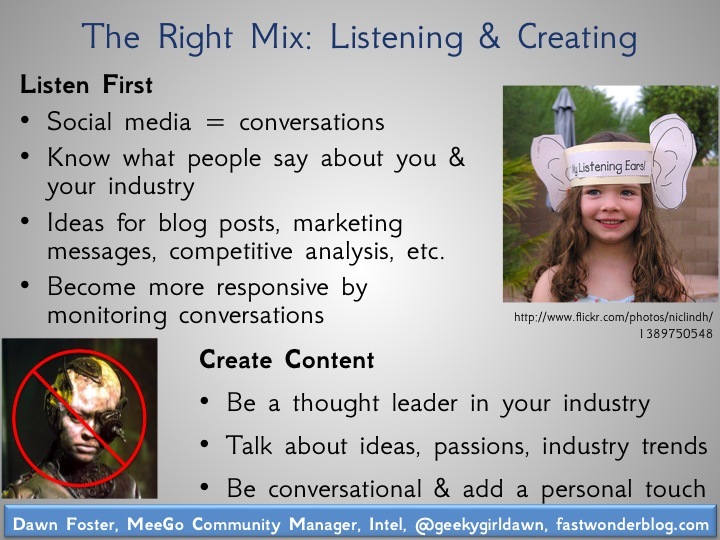 Whether you are managing an online community or a social media program for your organization, having the right mix of listening and creating content is important. Without listening to feedback, you are just creating content in a vacuum without gaining any insights from other people. If you just listen and create nothing, you are all but invisible and aren’t contributing anything to the discussion or even acknowledging that you are listening. The right balance differs for each organization, and it will probably take some time to find the right balance for you and your organization. Last week, I spoke on this topic as part of a panel session at the Portland Tech America Social Networks & the Enterprise Unite event. I used one slide to summarize my ideas, but I wanted to go into a little more depth here about the topic. Social media and online communities are all about the people, and people have conversations. They don’t share marketing messages. This means that people from traditional marketing backgrounds need to think a little differently about how they participate in communities by shifting the focus to conversations, and that initial focus should be much more heavily weighted to listening, rather than talking. Spend some time initially focusing on learning what people are saying about you, your organization, your industry and your competition. By paying attention to these conversations, you can learn so many unexpected ideas. People are probably using your products or services in new and innovative ways that you never intended. People are sharing interesting new ideas about your industry that you can use to improve your personal knowledge or improve some aspect of your organization. Your competition is probably sharing something that you want to know, and it can be worth the effort to see what individual employees at your competitors are saying online. One of the big questions is how to set up the right listening posts and filter the information down to something manageable that you can make sense of and process. The tools to monitor conversations range from free to fairly pricey depending on your situation. Free and Easy: I recommend that you start with some free tools that require very little expertise to get a better feel for what you want to monitor. Use TweetDeck or a similar application for realtime monitoring of Twitter, and keep this even if you move to a more robust monitoring solution, since most of the existing solutions don’t do a great job of realtime monitoring. Start with some Twitter searches using advanced operators and set up some Google alerts or Google news / blog searches with RSS feeds. All of this will give you a better feel for the volume of results and some ideas for what you need to filter out of your standard keyword searches. For smaller companies, you might find that this is all you ever need. Free with Knowledge Required: There are also plenty of free tools or do it yourself approaches that are still free, but they require some time to set up and some specialized knowledge to use. My favorite DIY tool is Yahoo Pipes. If you know how to use it, you can do more advance filtering than you can with the large expensive packages. This requires some time and a bigger learning curve; however, the biggest downside to most of these DIY approaches is that they don’t do a good job of counting results, looking at trends over time or providing pretty charts for your management staff. Paid Tools: The real benefit of these tools is that they are relatively easy to use, they do a good job of counting and charting mentions over time, and many of them provide additional workflow tools to help you manage responses. I have the most experience using Radian6, but there are many other available options. The cost can be worth it for many companies who have complex filtering needs, large volumes of responses, or who want something easy to use. As a side note, I use Radian6 for monitoring some large volume projects, but I also use TweetDeck for realtime monitoring, and I use Yahoo Pipes to fill in the gaps for specialty monitoring needs. I also have large numbers of RSS feeds that I read regularly. All of this information can also used as ideas for content, and to be more responsive to your customers or other people who have questions about your organization. You can answer questions or join those conversations, which brings us into creating content. Creating content in online communities and social media should be so much more than just company messages and press releases. This is an opportunity to show how much your employees know and give them place to showcase their industry expertise where they can talk about industry trends, experiences, ideas and the topics they are passionate about. Writing this type of thought leadership content gets the attention of other people within your industry who link to your content and bring in additional potential customers, which can help improve search engine optimization over the longer term. Much of this content will probably take the form of blog posts, and it can be daunting for people to have to come up with great content on a regular basis. This is why I recommend that organizations have group blogs where several people with different perspectives all contribute to make sure that one person isn’t bearing the whole load. There are also some tips and tricks for coming up with ideas for blog posts that include writing short posts, reusing other content, reacting to what others are saying, using research, doing interviews, and more. One of the biggest ways to make sure your content makes an impact is to make it personal. Talk about how you or your job has been impacted by a particular trend or idea. The reality is that people will be reading and responding to whatever you write, and people react more forcefully when they see some kind of personal connection. You want to sound like a real person with thoughts and ideas, and not like a corporate drone. After the talk someone asked me how she would know when she has done enough listening that she should start to participate and create content. You’ll know when you are ready because you’ll start to feel comfortable listening. You’ll know the language and abbreviations being used and will be eager to jump in. I recommend that you start small and participate gently at first. Start with one forum or one tool (like Twitter), and don’t do too much at first. Follow a couple of people (not hundreds or thousands) and start participating a little. After you really get started, then you’ll need to continue to find the right balance between listening and creating and make sure that you remember to continue to do both. I did a longer presentation with similar content at WebVisions last year, so you might also find this presentation interesting if you want a little more information. View more presentations from Dawn Foster. Here are the slides from the first part of the presentation, and you can download the full size version from SlideShare if you want a better copy than the version embedded below. 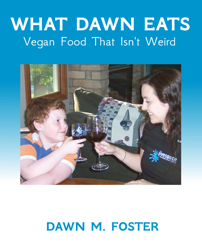 View more documents from Dawn Foster. In the monitoring section, I shared some of my favorite tools. Find any good RSS reader and populate it with the top blogs from your industry. Netvibes and Google Reader are good choices. Yahoo Pipes: More involved tool, but you can do some very advanced monitoring. I have a bunch of video and written tutorials for getting started with Yahoo Pipes.